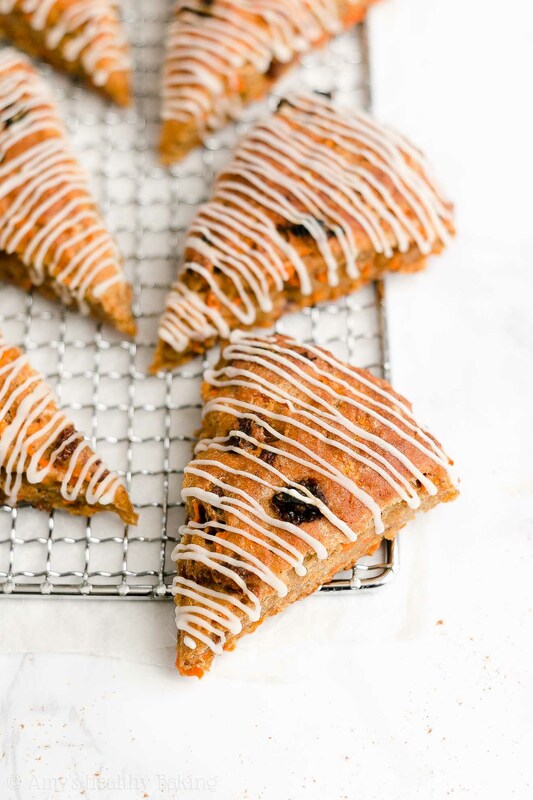 Learn how to make these moist carrot raisin scones from scratch! Much easier than you’d expect and just 141 calories with no eggs, refined flour or sugar! The sweet carrots and juicy raisins paired with this cozy spice blend is the perfect combination! A few weeks ago, I drove to Coronado to spend some time on the beach in the gorgeous mid-70’s sunny Southern California weather. Before staking out a spot on the sand, I walked over to Panera to grab something to eat. After pulling open the glass doors, I joined the line of people waiting to order. Although two workers stood at the cash registers, rapidly punching in people’s meal requests, I still waited a little longer than usual. Apparently, after the unusual increase in rainy days this winter in California, lots of other people had the same “get out of the house and enjoy the beach” idea as I did! As I stood in the entryway with just two patrons between the order station and me, I watched as an older lady tried to pick out her lunch. Eventually, after slowly scanning the entire menu, she settled on a salad, but when the man behind the counter started asking her questions to finalize her order, she grew even more indecisive. “Would you like a half or a full?” he inquired, and she stood there for a few seconds before asking what the difference was, weighing the two options, and selecting the half. “Would you like a baguette or an apple as your side?” Again, after another lengthy pause, she responded with chips. “We’re all out of those; is there something else we can get you?” She waffled a bit more, eventually settling on an apple and a kid’s fruit cup. The man read her order back to her, then finished with, “Would you like anything else?” The lady stared at the menu boards again, glanced to her left at the bakery display, and took a few steps towards it to get a better look at the muffins, cinnamon rolls, cookies, and cake slices. She hemmed and hawed yet again, halfway pointing at one of the scones sitting on a large platter, but then shook her head and handed over her credit card. 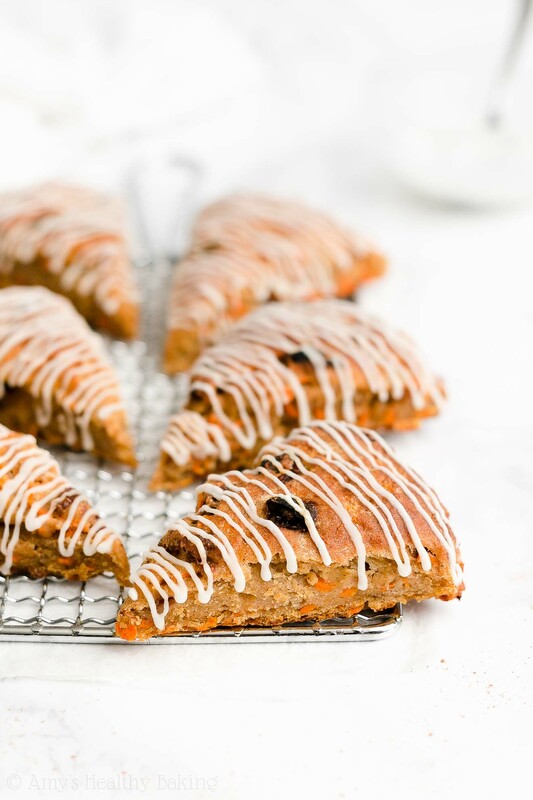 Yet I knew I had these Healthy Spiced Carrot Raisin Scones waiting for me back at home! 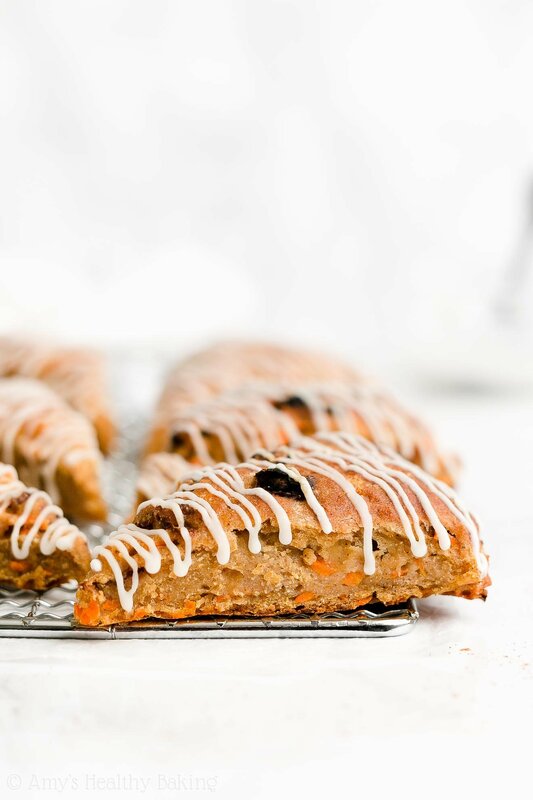 They’re supremely moist and tender on the inside with a hint of a crust on the outside, and they’re packed with naturally sweet carrots and juicy raisins. The warm and cozy spice blend adds a deep richness and fancy flavor, making these even more irresistible than the ones I saw at the restaurant! Also unlike the Panera scones? These contain refined flour or sugar (along with no eggs either!) and just 141 calories! That’s definitely my idea of the perfect scone! 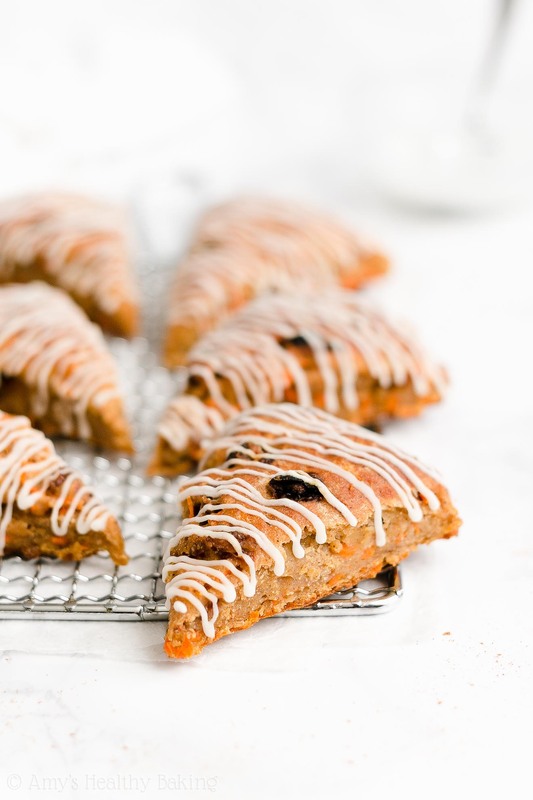 So let’s go over how to make these healthy spiced carrot raisin scones! You’ll start with white whole wheat flour and your homemade chai spice blend. “Chai spice” simply refers to the spices usually found in chai, a type of Indian tea. The most common ones are cinnamon (← that’s my favorite variety! ), ginger, cloves, and cardamom. 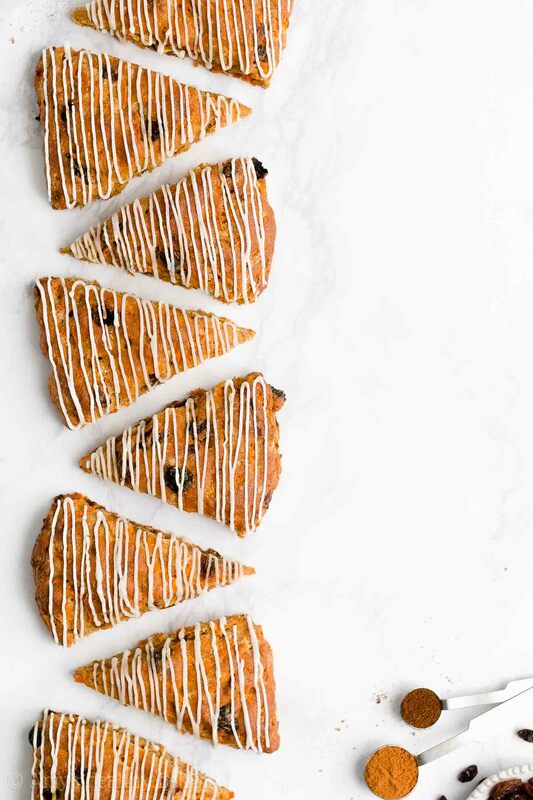 For these particular scones, I also mixed in a touch of allspice and nutmeg to create an even richer, fancier, and more complex flavor in these healthy chai spice carrot raisin scones. All of my taste testers unanimously agree—it’s definitely worth including every single one of these spices! White whole wheat flour actually exists, and it’s not a combination of white (aka all-purpose) flour and regular whole wheat flour! Instead, it comes from a special variety of soft white wheat (hence the name! ), whereas regular whole wheat flour comes from a heartier variety of red wheat. They both have the same health benefits (like extra fiber! 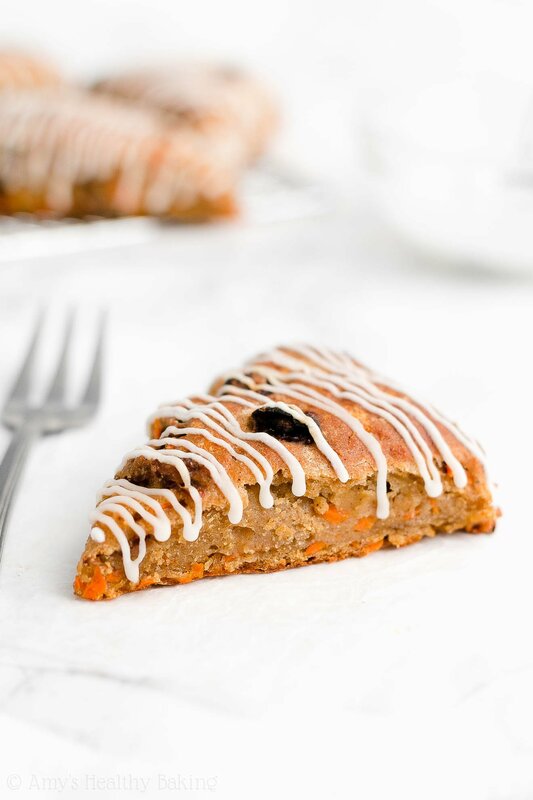 ), but white whole wheat flour has a lighter taste and texture… And that lets the cozy spice flavor and moist texture of your healthy chai spice carrot raisin scones truly shine! Just remember, it’s really important to measure the flour correctly, using this method or a kitchen scale. (← That’s the one I own and love!) Too much flour will make your scones dry and crumbly, rather than supremely moist and tender. As the next key step, you’ll work in a small amount of very cold butter using a pastry cutter (← I highly recommend that!) or the back of a fork. Keep going until the butter is completely mixed into the flour mixture and looks like very small crumbs! It’s extremely important to use very cold butter that comes straight from the refrigerator. (Freezing isn’t necessary for this recipe!) This is because the butter creates tender little pockets in your scones as it melts in the oven. 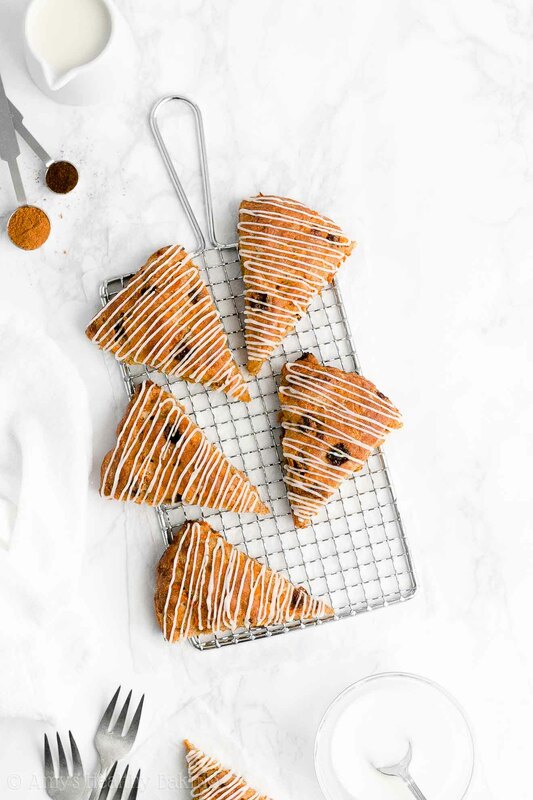 If your butter started to soften or melt ahead of time, you’d miss out on that perfect tender texture in your healthy chai spice carrot raisin scones! Tip: This is why I strongly recommend against using coconut oil. It melts at a much lower temperature compared to butter, so it’s nearly impossible to keep coconut oil cold and solid while mixing together your dough. 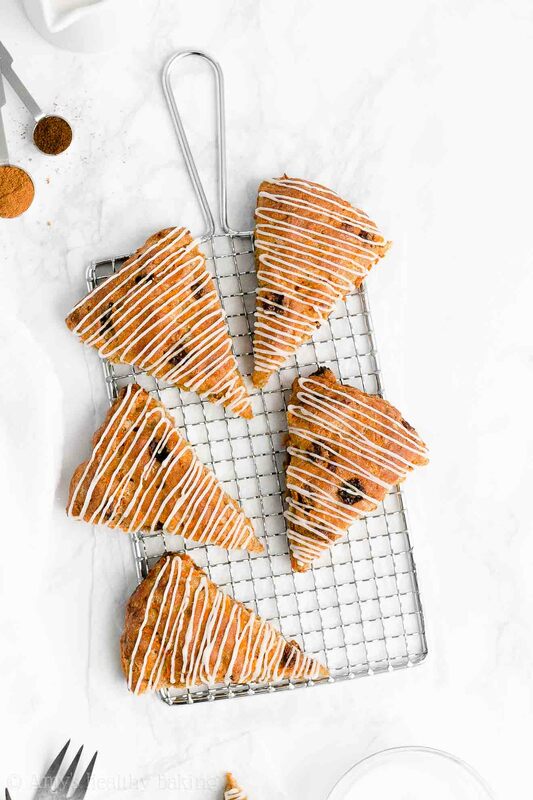 See the Notes section of this healthy chai spice carrot raisin scones recipe for a dairy-free and vegan option! Whereas traditional scone recipes call for lots more cold butter and usually whole milk or heavy cream to keep them moist and tender, you’ll use something else… Greek yogurt! If you’ve browsed through my recipes before, then you know it’s one of my favorite ingredients in healthy baking. 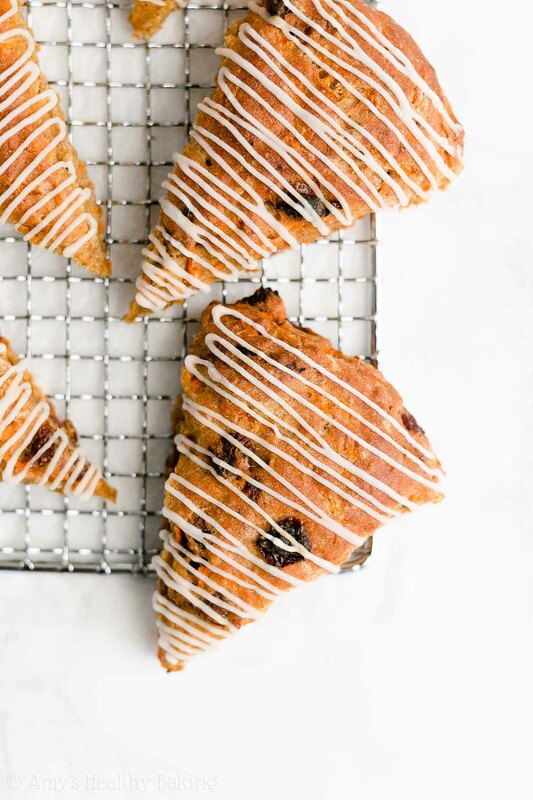 Here, it adds the same moisture as extra butter or cream but for a fraction of the calories, and it also gives you healthy chai spice carrot raisin scones a protein boost! Ready to fold in the mix-ins? You’ll need freshly grated carrots and raisins. Yes, the carrots must be freshly grated! Do not substitute store-bought pre-shredded carrots (also called “matchstick” carrots). They’re thicker, drier, and much more bland compared to freshly grated carrots, and those store-bought shredded carrots don’t soften properly while baking. I promise it’s worth grating your own! Before you add the raisins, I have two special tricks for you! First, cut your raisins in half. 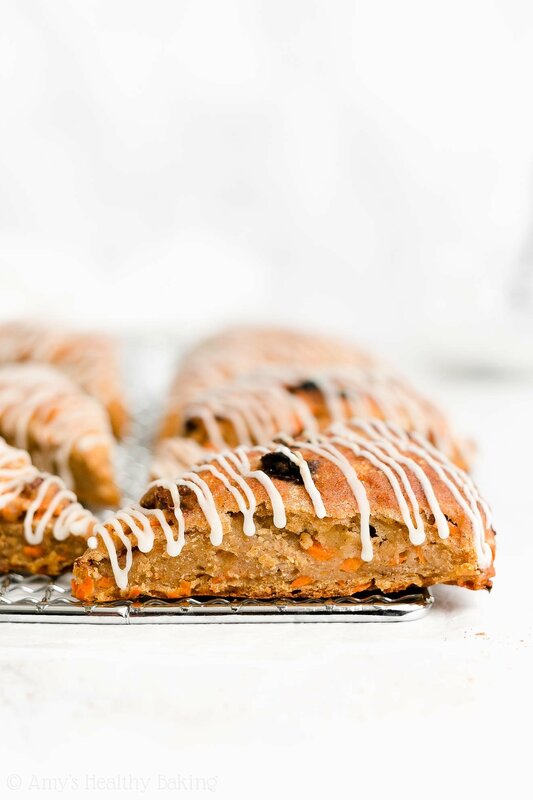 This ensures you get a bit of raisin in every bite of your healthy chai spice carrot raisin scones! Second, add those chopped raisins to a microwave-safe bowl, cover them with water, and place a lid or plastic wrap on top. Pop that in the microwave for 1 minute, then let your raisins sit for at least 5 minutes (or while you measure and mix together all of the other ingredients!) This trick is called hydrating the raisins, and it ensures your raisins turn out supremely plump and juicy. I use this trick whenever I’m baking with raisins. It’s a total game changer! Almost time to bake! Transfer your dough to your baking sheet, and shape it into a large ¾” tall circle using a spatula. (I use these mini spatulas. Aren’t they cute??) It’s okay if the dough is a little sticky. Moist and slightly sticky dough leads to moist and supremely tender healthy chai spice carrot raisin scones! Next, you’ll brush the tops and sides with milk. This seals moisture into the dough, keeping the insides fluffy and tender, and it also creates a hint of a crust on the outsides. I love that texture contrast! 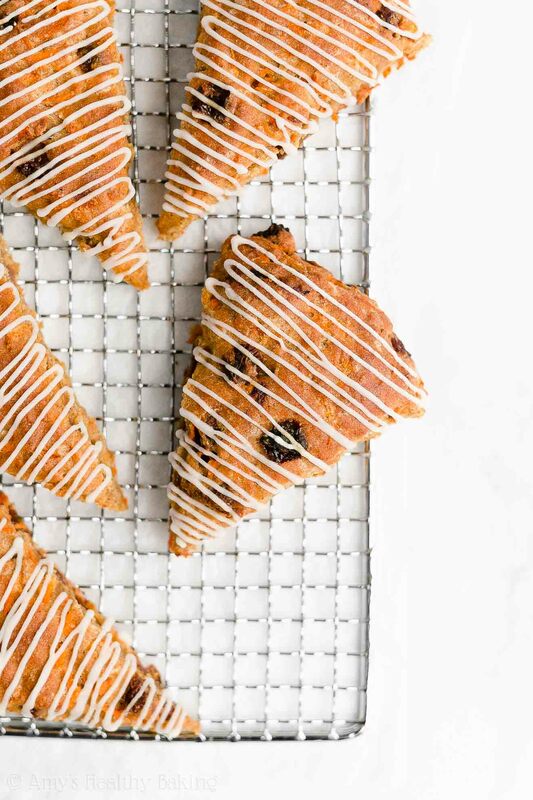 Enjoy your cozy, fancy, yet still healthy breakfast pastries! And when you make your own, remember to snap a picture and share it on Instagram using #amyshealthybaking and tagging @amyshealthybaking IN the photo itself! (That guarantees I’ll see your picture! 😊) I’d love to see your healthy spiced carrot raisin scones! These breakfast pastries may look and taste like they came from a fancy bakery, but they’re surprisingly easy to make! These scones are supremely moist and tender on the inside with a hint of a crust on the outside, and they’re full of sweet carrots, juicy raisins, and plenty of warm spice flavors. Leftovers will keep for at least five days (if not longer!) if stored in an airtight container in the refrigerator. Preheat the oven to 425°F, and line a baking sheet with a silicone baking mat or parchment paper. In a medium bowl, whisk together the flour, baking powder, cinnamon, ginger, allspice, nutmeg, cloves, cardamom, and salt. Cut in the butter with a pastry cutter (highly recommended!) or the back of a fork until the mixture resembles fine crumbs. Stir in the Greek yogurt, maple syrup, 3 tablespoons of milk, and vanilla. Fold in the grated carrots and raisins. Shape the dough into a ¾” tall circle on the prepared baking sheet using a spatula, and brush with the remaining milk. Slice the circle into 8 triangular segments with a sharp knife. Bake at 425°F for 25-29 minutes, or until the tops are deep golden and the center feels firm to the touch. Cool on the pan for 5 minutes before transferring to a wire rack to cool completely. Notes: For the gluten-free flour, I recommend the following: 1 cup (120g) millet flour, ¼ cup (30g) tapioca flour, ¼ cup (30g) brown rice flour, and 1 teaspoon xanthan gum. Most store-bought gluten-free flour blends (like this one!) will work as well, if they’re measured like this. Whole wheat pastry flour, regular whole wheat flour, or all-purpose flour may be substituted for the white whole wheat flour. Remember to measure the flour correctly, using this method or a kitchen scale. (← That’s the one I own and love!) Too much will dry out your scones and make the dough crumbly. It’s very important that your butter is cold, straight from the fridge. (Freezing it isn’t necessary for this recipe!) With very cold butter, it won’t heat up until you put the scones in the extremely hot oven, and it will create little air pockets and a very tender crumb when it melts. As written, these scones aren’t overly sweet. If you prefer sweeter scones, substitute an additional 1-2 tablespoons of pure maple syrup for an equal amount of milk. Before adding the raisins, cut them in half. (This ensures every bite contains a bit of raisins!) To hydrate, add them to a microwave-safe bowl, and completely cover them with water. Add a lid on top or tightly cover the top with plastic wrap. Microwave on high for 1 minute. Let the raisins rest for at least 5 minutes (or while measuring and mixing together the other ingredients!) Drain thoroughly before adding to the mixing bowl. This makes them especially plump and juicy! Do not substitute store-bought pre-shredded carrots (also called “matchstick” carrots) for the freshly grated carrots. Store-bought pre-shredded carrots are too thick and dry, and they don’t soften properly while baking. For a vegan version, I recommend Earth Balance sticks in place of the butter, your preferred non-dairy yogurt in place of the Greek yogurt, and non-dairy milk in place of the nonfat milk. Optional Drizzle: Stir together 5 teaspoons of confectioners’ style erythritol and 1 – 1 ½ teaspoons of milk (any kind!) in a small bowl. Transfer the mixture to a zip-topped bag, cut off a tiny piece of one corner, and drizzle on top of the cooled scones. For this drizzle, I buy my confectioners’ style erythritol online here. In a pinch, regular confectioners’ (powdered) sugar may be substituted for the confectioners’ style stevia. However, regular powdered sugar is more absorbent, so start with ½ teaspoon of milk and add more as necessary to achieve the desired consistency. If you’d like to fully coat your scones with the drizzle instead, you definitely can! Just make 3-4 times the amount of drizzle, and dip the tops of your scones directly into the bowl instead of transferring the glaze to a plastic bag and snipping off the corner. When refrigerating leftover scones that have already been drizzled, the drizzle will turn brittle and crack if made with erythritol, or it will dissolve into the scones if made with powdered sugar. Neither will affect the flavor—only the appearance! ♡ …and the rest of Amy’s healthy scone recipes!